Life is all about compromises right? But how do you comprise with color when you are on opposite sides of the color spectrum? Actually, it’s pretty simple. Here’s what you can do. Here I have a graphic symbolizing a rough layout of my clients color palette. Knowing that Mrs. wanted substantial color and Mr. did not, I divided the colors so everyone would be happy. I have her stronger color for the living room, office and dining room. They are not as bold as typical jewel tones but still have a substantial kick in pigment. 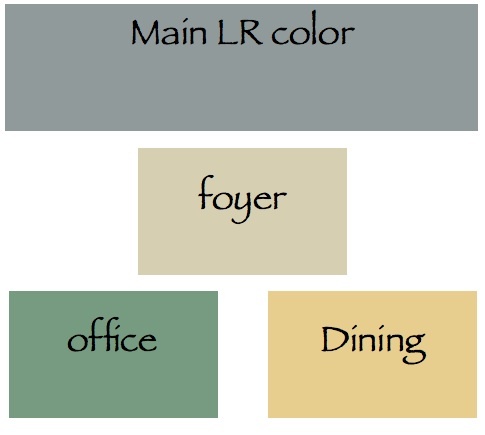 (computer representations vary) However, in the core of this home which is the foyer and kitchen, I used a neutral color so Mr. would be happy as well. Many of the homes here in South Charlotte have open floor plans so the core is really a great area to use a neutral color. This way, you can use bolder color in the other rooms of the home without it getting the Quilt look. When choosing color for your home it’s imperative that everyone in the home is happy with the color choices and yes, a compromise is always a good idea. If you need help choosing color for your home, I’d be more than happy to help you out! This entry was posted in Color, Interior Design, South Charlotte and tagged bold color, color, compromise, dining room, foyer color, jewel tones, kitchen, living room, neutral color, office, South Charlotte. Bookmark the permalink. Great post and lovely color palette, too! Thanks Kelly. She wanted very specific colors and he didn’t. This seemed to be a good compromise.